With the perfect combination of fast and slow-release proteins, the PhysIQ Protein Shake builds lean muscle while curbing your appetite. Putting more muscle into your weight management program starts with a different kind of protein. When you work out, you’re hungry. And when you’re hungry, you reach for sugar and carbs. 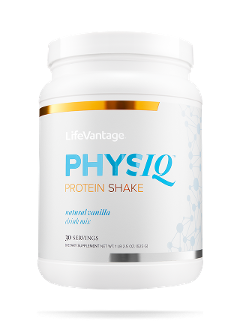 The LifeVantage PhysIQ Protein Shake combines Whey and Micellar Casein proteins for their powerful complementary properties. Whey protein works in the short term to greatly increase your natural ability to build muscle while Micellar Casein protein maintains that environment for long-term results. This blend of proteins helps deliver natural amino acids to your blood to encourage new muscle growth and speed up workout recovery. Quickly digested, Whey protein satisfies hunger right away and triggers an immediate increase in amino acids — stimulating protein synthesis and enabling significant muscle growth. Branched-chain amino acids are the building blocks of protein that support protein synthesis by your muscles and prevent protein breakdown. Contained in both the Whey and Micellar Casein proteins, you get all the amino acids you need to help build new muscle and speed up recovery after a workout. Slower to digest, Micellar Casein protein fends off your appetite — creating a long-term, supportive environment for building lean body mass. Whey Protein Concentrate, Micellar Casein, Natural Flavors, Organic Dried Cane Sugar, Coconut Oil Creamer (Coconut Oil, Maltodextrin, Sodium Caseinate, Mono and Diglycerides, Silicon Dioxide), Xanthan Gum, Sea Salt, Sunflower Lecithin, Stevia Leaf Extract.